From the uprisings across the Arab world to the devastating earthquake, tsunami and nuclear disaster in Japan, there was no lack of news in 2011. 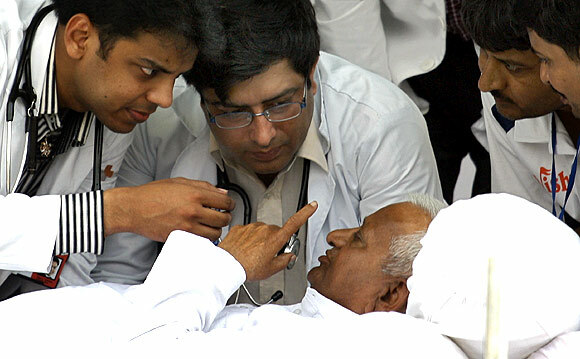 In this special series, rediff.com brings to you images that helped define the year. The race car of driver Will Power (L) goes airborne during the IZOD IndyCar World Championship race at the Las Vegas Motor Speedway in Las Vegas, Nevada. 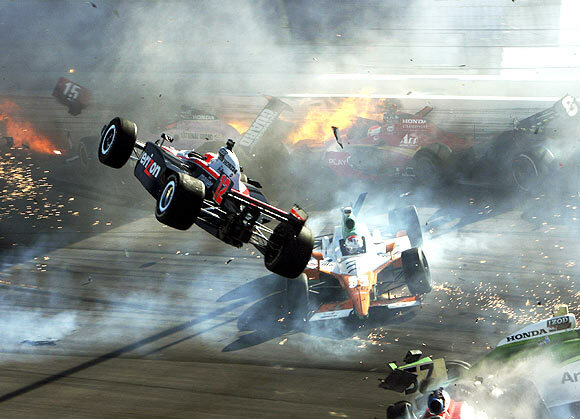 The motor racing world was left reeling from the death of time-two Indianapolis 500 champion Dan Wheldon while. Wheldon's death in the IndyCar finale at Las Vegas Speedway left fans stunned and plunged series officials into crisis management mode as the season-ending celebration turned to disaster. Picture taken October 16, 2011. 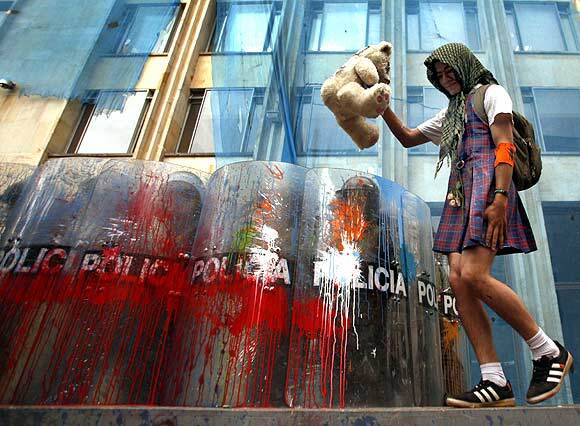 A student takes part in a march during a demonstration in Bogota. Thousands of students marched in a nation wide protest against the education government's reform of public universities, student organisations reported. 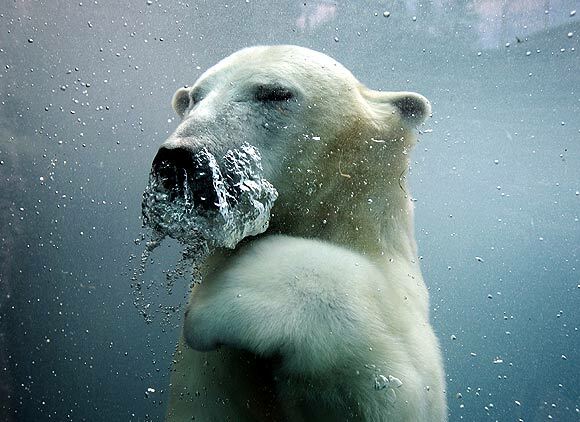 A polar bear swims underwater in the St-Felicien Wildlife Zoo in St-Felicien, Quebec in Canada. According to Environment Canada, Canada is home to around 15,000 of the estimated 20,000 polar bears in the world. The US (Alaska), Russia, Denmark (Greenland) and Norway are the other four countries where polar bears can be found. 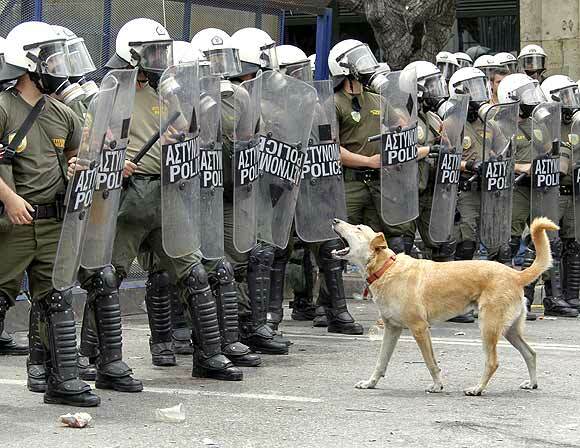 A dog barks at a formation of riot police near the Greek parliament in Athens. Tens of thousands of grassroot activists and unionists converged on Athens' central Syntagma (Constitution) Square Wednesday as Prime Minister George Papandreou prepared to push through a new five-year campaign of tax hikes, spending cuts and selloffs of state property to continue receiving aid from the European Union and International Monetary Fund and avoid default. 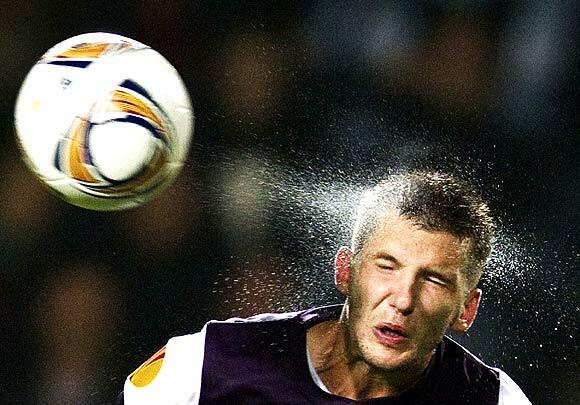 Austria Vienna's Alexander Gorgon heads the ball during the Europa League Group G soccer match against Malmo in Malmo. 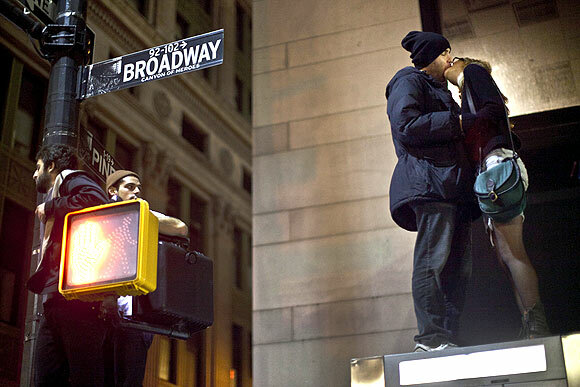 Protesters affiliated with the Occupy Wall Street movement kiss while standing on top of a bus stop during an unannounced raid by the New York City Police Department outside Zuccotti Park in New York, in the early hours of November 15, 2011. Police wearing helmets and carrying shields evicted protesters with the Occupy Wall Street movement from the park in New York City's financial district where they camped since September. 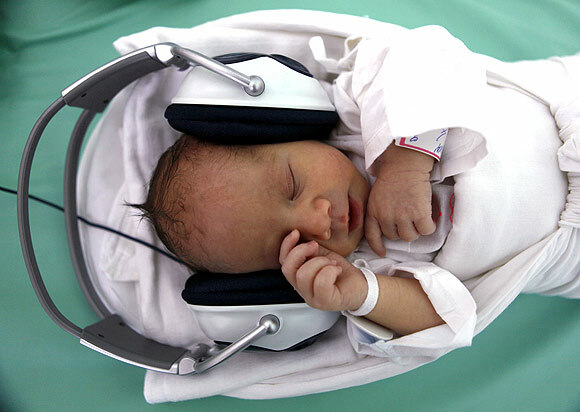 A newborn baby rests in a box, listening to music played through earphones in Saca Hospital in Kosice in east Slovakia. The hospital uses music as therapy for newborn babies when they are separated from their mothers. 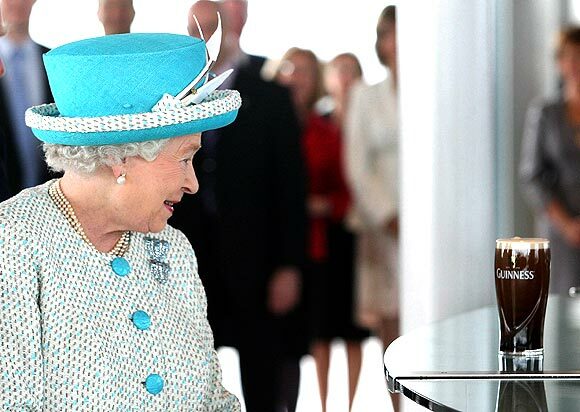 Britain's Queen Elizabeth looks at a pint of Guinness poured by Master Brewer Fergal Murray at the Guinness Storehouse, in Dublin. Britain's Queen Elizabeth was on the second day of a four day state visit, the first by a British monarch since Ireland's independence. US director Woody Allen reacts during the shooting of his movie 'The Bop Decameron' in downtown Rome. 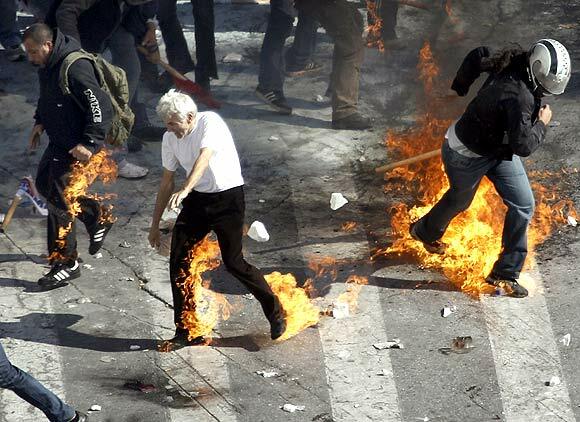 Demonstrators are hit by petrol bombs during clashes between rival groups of communists and black-clad youths near the Parliament building in Syntagma (Constitution) square in Athens on October 20. 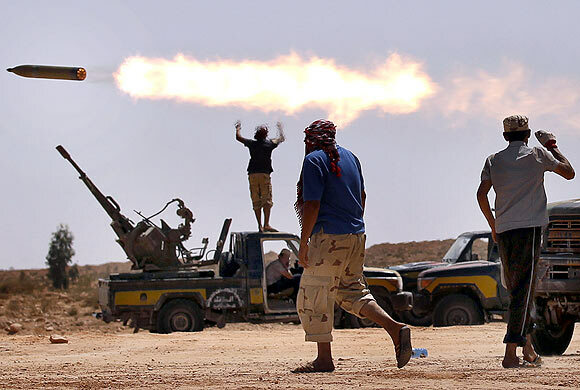 Anti-Gaddafi fighters fire a multiple rocket launcher near Sirte, one of Muammar Gaddafi's last remaining strongholds. Libyan provisional government forces backed by NATO warplanes swarmed into the city of Sirte but weathered heavy sniper fire as they tried to win control of one of deposed leader Muammar Gaddafi's last bastions of support. 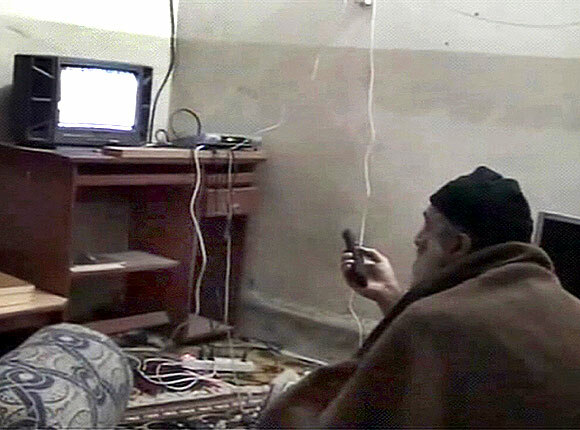 Osama bin Laden is shown watching himself on television in this video frame grab released by the US Pentagon on May 7. Five videos were found in bin Laden's compound in Abbottabad, Pakistan after US Navy Seals stormed the compound and killed bin Laden. The compound in Pakistan where US forces killed bin Laden was an "active command and control center" where the Al Qaeda leader remained in strategic and operational control of the organisation, a senior US intelligence official said on May 7. 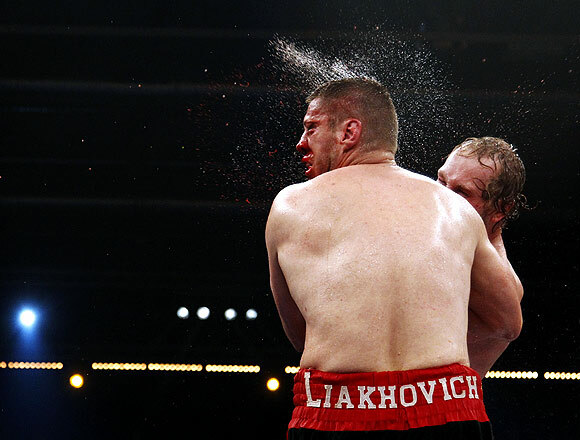 Robert Helenius of Finland (R) and Siarhei Liakhovich of Belarus exchange punches during the World Boxing Organisation (WBO) and World Boxing Association (WBA) Intercontinental Heavyweight Championship fight in Erfurt. Helenius won by a knockout in the 9th round. 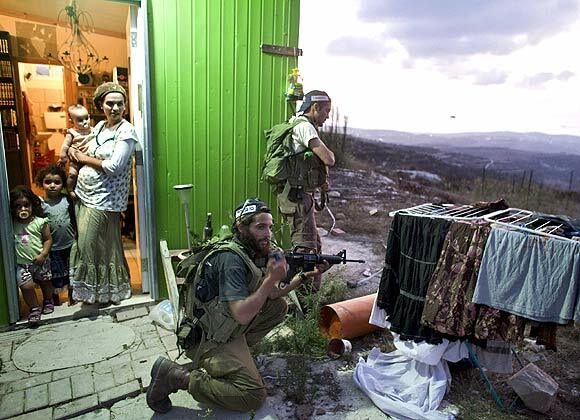 Jewish settlers take part in a general drill to protect their unauthorised outpost of Havat Gilad, south of the West Bank city of Nablus. General drills take place on a regular basis in Jewish settlements and outposts throughout the West Bank. An Iraqi boy is taken away from a suspected militant, who has been accused of killing his father at the height of the sectarian slaughter in 2006-07, during a presentation to the media at the Interior Ministry in Baghdad. 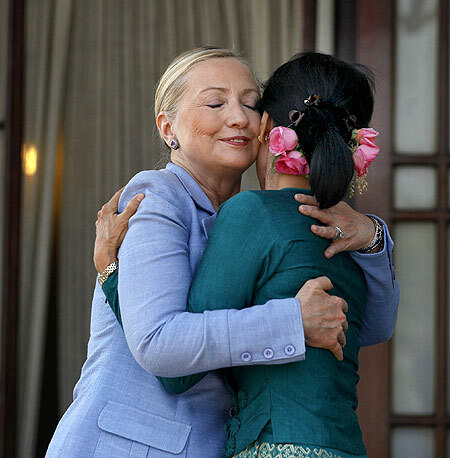 US Secretary of State Hillary Clinton (L) hugs Myanmar's pro-democracy leader Aung San Suu Kyi as they meet at Suu Kyi's house in Yangon. Clinton held a final meeting with Suu Kyi as she wrapped up a landmark visit to Myanmar which saw the new civilian government pledge to forge ahead with political reforms and re-engage with the world community. 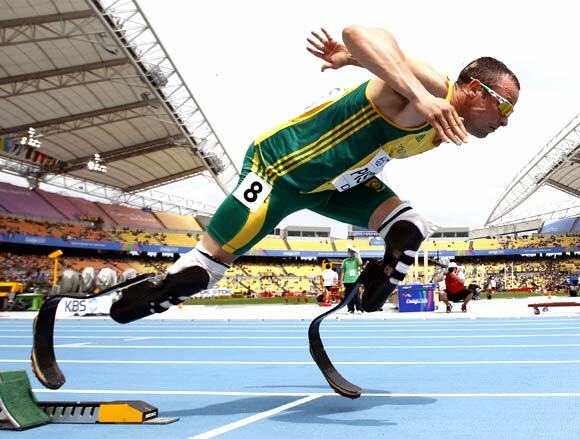 Oscar Pistorius of South Africa comes out of the starting blocks during his men's 400 metres heat at the IAAF World Championships in Daegu. 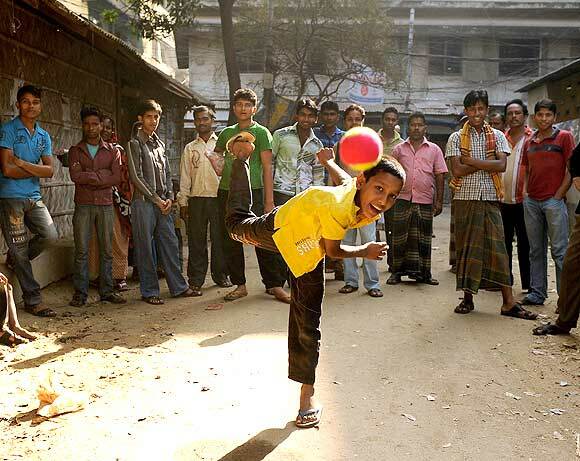 A boy bowls a ball in a street, as a crowd of people watch, in Chittagong. Fans watch and take photos of Rafael Nadal (R), of Spain as he towels off after defeating compatriot Feliciano Lopez at the Sony Ericsson Open tennis tournament in Key Biscayne, Florida.